The end of an outright ban on tail docking for dogs is a step closer after Holyrood's environment committee backed exemptions for specific breeds. 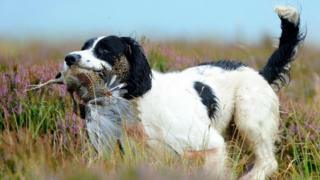 The government wants to amend legislation to let vets shorten the tails of some working dogs. MSPs on the committee backed the plans by seven votes to three. A consultation showed widespread support for docking for some breeds, but Green MSP Mark Ruskell slammed the plans as "cruel and unnecessary". The plans will now to go to a vote of the full chamber. SNP and Conservative members of the committee backed the amendment, suggesting there will be a majority in favour of the plans. The Scottish government brought in the ban on tail docking in 2007 as part of the Animal Health and Welfare (Scotland) Act, becoming the only part of the UK with a blanket ban. However, ministers now propose bringing in exemptions similar to those elsewhere in the UK for working dogs such as spaniels, hunt point retrievers and terriers. The environment committee backed changes, which would be limited to the end third of the tail, after hearing evidence from Environment Secretary Roseanna Cunningham. She told them there was evidence that working dogs were at increased risk of injury without having their tails docked. She said: "The regulations ensure as far as is reasonably possible that only dogs likely to be used for lawful shooting purposes can have their tails shortened and that veterinarians are the only persons who may carry out the procedure." The minister conceded that tail docking was "a highly emotive issue", but said the proposed amendment would "place the responsibility for making the decision in the ends of those who are, in my view, best placed to make an informed professional judgement". Image caption Roseanna Cunningham said she recognised tail docking was a "highly emotive issue"
The move came after 92% of those who took part in a Government consultation supported docking for these breeds. Scottish Government Veterinary Adviser Andrew Voas told the committee he estimated around 80 puppies would have their tails docked a year to avoid having to carry out one amputation on an older dog due to injury, which would cause more pain than the earlier procedure. Ms Cunningham denied that the government was creating a loophole in the law, despite conceding that some puppies with shortened tails would "clearly" end up as pets. Mr Ruskell, who opposed the plans in the committee, said vets and welfare charities had warned against this as a "retrograde practice". He said: "The amputation of hundreds of puppies' tails just to avoid one amputation in an adult dog is anti-science and nothing more than a sop to vested interests. "Today's vote in committee is disappointing but the fight goes on ahead of a full vote in the Holyrood chamber." Labour members Claudia Beamish and David Stewart also voted against the plans at the committee. Fellow Labour MSP Colin Smyth said the plan was "disgusting" and "cruel", adding that the Scottish governments record on animal welfare was "appalling".